There is no minimum – or maximum order for our custom printed boxes! Our brand new state of the art digital printing process makes this cost-effective form of branding a reality for the smallest business as well as larger ones. We welcome short-run quantities on custom cardboard boxes – even if it’s only one bespoke box, for a sample presentation perhaps. Digital reproduction is superb and suitable for white or brown corrugated cardboard (single or double walled) as well as solid board. It's easy to transform everyday boxes (die cut and made to measure), or cardboard sleeves, with anything from a single-colour logo to stunning full-colour images. You can have the inside printed too, especially effective for messages or instructions on the inner lid flap. For your bespoke design all we need is your brief with the logo and/or image placement. Just send us an existing jpeg or pdf file and we’ll do the rest. With our competitive short run pricing on custom printed boxes, you can have even just one carton die cut and printed to order. Our customised cardboard boxes can be produced and printed to your specifications in any quantity – up to thousands – made to your size and style requirements, thanks to the advanced technology of our top quality digital printing process. Whatever industry you are in we can help you with the appropriate made to measure cardboard boxes, clearly and beautifully printed with your design, text and/or logo. There are many applications for custom printed boxes, which are one of the most cost-effective forms of marketing since they combine your company brand with professional protective packaging. We are happy to discuss your needs and will work with you to provide the packing solution that suits you. Please could you now provide us with any other information you feel may be relevant. For example; what the box is to carry, and what is will be used for (storage/transportation). An idea of your product's weight may also be useful if known. 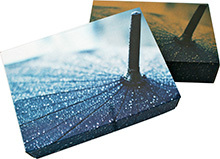 Our custom made boxes have guaranteed strength and durability. They are made from a combination of pure and recycled material, but can be made from 100% recycled material on request. Our custom packaging solutions come in various forms depending on the products you intend to pack and, of course, your market. If your parcels are to be sent by mail, a sturdy custom packing box or carton is a must. A wide range of corrugated or solid boards are available for custom-made boxes, and we can print on them your logo or artwork, in any size, with eye-catching print quality. 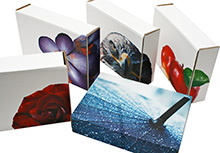 Whether it's a stunning image or basic logo, our digital printing technology will make your boxes stand out. There's no minimum order for this service, and we can produce your bespoke design from your jpeg or pdf file. This makes our customised cardboard boxes perfect for both small and large businesses. The managers of any successful organisation would say that if you’re going to make it in the business world you must be able to establish a name, especially with your target customers. There’s no doubt that customised cardboard boxes / cartons will give you that edge. It’s one of the best marketing tools, helping boost the credibility of you and your business.